The Southwest Airlines Rapid Rewards Premier Card has a high $99 annual fee, though its earning scheme is average at best. However, the Rapid Rewards redemption scheme can offer great opportunities that go further than simple flight redemptions. With enough points, you can earn a year-long companion pass, which will allow your friend or partner to accompany you for free – even on an award ticket. In addition, even though Southwest has positioned itself as a low-cost carrier, it has earned its stellar reputation by going above and beyond the call of duty, rejecting the nickel-and-dime business techniques of other airlines. You still get two checked bags for free and you don’t have to pay for ticket changes. These are rare benefits in this day and age. The Southwest Rapid Rewards Premier Card is currently offering a competitive sign-up bonus – 40,000 points if you spend $1,000 in the first three months. While this is not the highest bonus you’ll find among airline cards, the spend threshold is easy to reach. Southwest also offers some great deals that will help you stretch the bonus points a long way. You can get a round-trip flight for as few as 3,500 points. Of course, you can also spend more than 25,000 points on just one flight, which is why it’s important to choose your redemptions wisely. If you redeem for a “Wanna Get Away” fare, you can get a return on value as high as 1.6 cents per point. You can also use Rapid Rewards points during some of Southwest’s amazing sales to get an incredible value. The card also offers a modest annual bonus of 6,000 bonus points after your card member anniversary for as long as you keep the card. While this is not as generous as some of the top airline cards, it’s still a nice perk for loyal card members. You earn two points for every dollar on Southwest purchases made directly with the airline, and two points per dollar you spend on Southwest hotel and car rental partner purchases. All other purchases earn you one point per dollar. While this is fairly typical rewards scheme for an airline loyalty card, it’s on the low side. You can find co-branded cards that offer much higher earnings and even better rewards rates with a general rewards card. Although Southwest doesn’t have premium class cabins, the elite status has some valuable benefits, such as priority boarding and security, point bonuses, and more. The Southwest Airlines Rapid Rewards Premier card lets you earn 1,500 points toward elite status for every $10,000 spent on the card up to 15,000 qualifying points every year. This is a modest boost toward reaching A-List status – which requires 25 flights or 35,000 points – but it can help. One of the most valuable benefits of the Rapid Rewards program is the Companion Pass, though it is hard to reach for most travelers. You earn a Companion Pass after booking 100 one-way flights or earning 110,000 points in one calendar year. This allows you to designate a companion to take on any Southwest flight for just the cost of taxes and fees. When you earn the Companion Pass, it is valid for a year or longer. No matter when you earn it in one calendar year, it is valid until the end of the next calendar year. While Southwest is not renowned as an international airline, there are a few ways to use your points for international travel. You can book an award ticket to a number of destinations in the Caribbean, Mexico and Costa Rica. There are also plans to begin flights to Hawaii. You can get up to 15,000 points by transferring a balance from another credit card at one point for every dollar, but this is not a good idea. Not only will you pay a whopping 5 percent balance transfer fee, but the APR, which can range from 18.24 to 25.24 percent variable (there is no introductory rate offer), makes it prohibitively expensive. This is a Visa Signature card that includes many useful benefits for frequent travelers, such as car rental insurance and compensation for delayed and lost luggage. One of the most valuable benefits is the lack of a foreign-transaction fee. You can use the card abroad without having to pay the extra 2 to 3 percent that most cards charge. 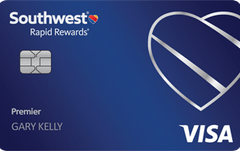 Why get the Southwest Rapid Rewards Premier card? You want a Companion Pass or a boost in points to achieve elite status. You want the Visa Signature benefits. Make sure to meet the $1,000 spending requirement in the first three months to get the sign-up bonus. Come up with a strategy of earning 110,000 points within a calendar year if you’re interested in the Companion Pass. Try to redeem your points on the Wanna Get Away rates and Southwest specials.